The UK's Defence Secretary Gavin Williamson bid farewell to British Army aviators as they took off for Estonia, where they will be training alongside NATO forces working to reassure the allies and deter Russian forces. The creation of the ePF was a direct result of the Warsaw Summit of 2016 amid, concerns about Russian aggression following its annexation of Crimea in 2014. The eFP is an enhanced deployment of defensive, combat-capable forces in countries which include Estonia, Latvia, Lithuania and Poland. In the region, there are forces from Germany, the US and Canada side by side with the UK aiming to deter any future Russian aggression. 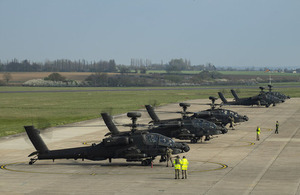 Defence Secretary Gavin Williamson said: "The first deployment of Apache helicopters to Estonia underlines our position at the forefront of NATO. This is a world class machine operated by world class Army aviators and this deployment demonstrates our unwavering commitment to NATO’s collective defence." Major Dave Lambert, Officer Commanding 663 Sqn, said: "The deployment to Estonia is a fantastic opportunity for the Squadron to challenge itself. It will test how we deploy and operate overseas, develop our operational partnership with the Wildcat and our ability to work alongside our NATO allies. Everyone in the Squadron – from ground crew to pilots - has worked hard to prepare for Estonia, and we’re looking forward to establishing ourselves in theatre and contributing to NATO’s Enhanced Forward Presence."